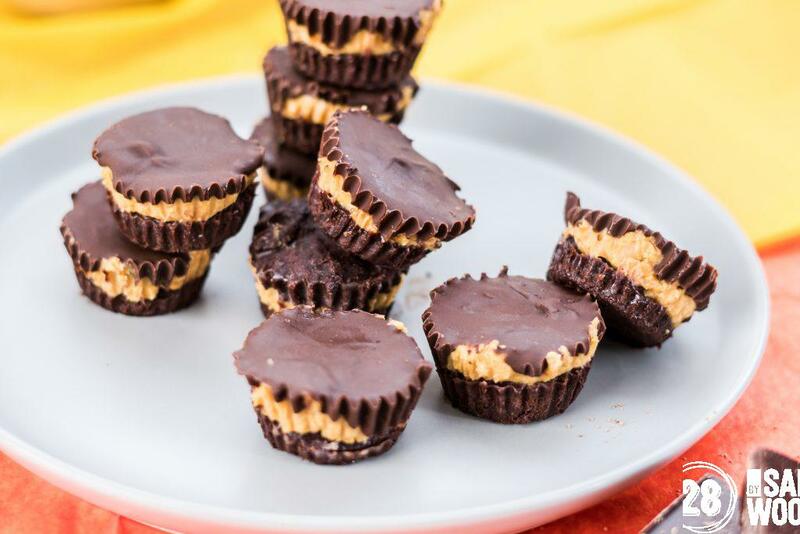 of all I Quit Sugar recipes"
These chocolate nut butter cups are just like the commercial peanut butter cups... only way better. 1/2 cup coconut oil, melted. 1/2 cup raw cacao powder. 1 tablespoon rice malt syrup. 1/4 cup smooth natural peanut butter. large pinch of sea salt. You know those junky peanut butter cups you can buy? Well, these are same-same-but-way-better. The coconut cream in this recipe makes the 'chocolate' smoother. Interestingly, I find the more coconut cream you use, the harder the chocolate texture. 1. Arrange small chocolate papers on a tray. Combine the coconut oil and cacao powder until smooth, then stir in the syrup and coconut cream. Pour a thin layer into the bottom of the chocolate papers. Freeze for 5 minutes. 2. Remove from the freezer and spoon ⅓ teaspoon nut butter into each one. Pour the remaining cacao mixture on top and scatter sea salt over. Refrigerate for 30 minutes until set (or, if you’re short of time, freeze them). Eat straight from the fridge – these won’t last at room temperature. You can make your own nut spread at home; here's a link to the recipe. Coconut Butter Cups: make a coconut version by using a small ball of coconut butter instead of the nut spread. Peppermint Patties: Make peppermint patties by adding a few drops of peppermint oil (to taste) to small balls of coconut butter instead of the nut spread. Berry Cups: Make a berry version by placing a frozen raspberry in the middle instead of the nut spread. We recommend Pureharvest rice malt syrup. We advise eating sweet foods like this one as occasional treats only. Also, we encourage you to cut the sweetener down even more if you can. We've made these without any sweetener at all and they're delicious. © 2018 28 by Sam Wood.